(1) Lake County, Illinois. 27 November 2015. I don't intentionally go looking for these odd Herrings, but they're hard to ignore when they get in my line of sight. Thanksgiving Day, 26 November 2015; Lake County, Illinois. A somewhat pronounced gonys angle, coupled with a few renewed upper scaps and an apparent short wing projection gives this Thayer's a somewhat "Cook Inlet" look. Photo 1 of 5. 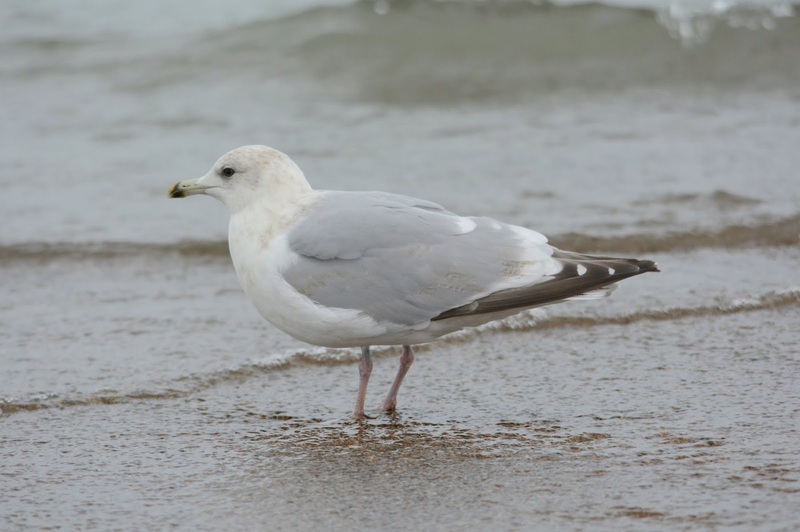 One of the joys of watching gulls in the Lake Michigan region in winter is encountering individuals from the Thayer's/Kumlien's/Iceland complex. My personal estimate is that there's 6-7 Thayer's for every Kumlien's Gull that we see here on the southern rim of the lake. We've never knowingly seen nominate glaucoides on Lake Michigan. Much more intriguing though is the number of individuals that, if found on the Pacific or Atlantic, would be readily identified as the expected taxon in that region. Given the opportunity to "overthink" some of these birds, one may look at the same photograph months later and "aptly" assign a different label. I first spotted this bird in flight, and immediately called it a Kumlien's Gull due to the muted an relatively pale wingtip. My first impression, I've learned, is usually the best impression (given neutral lighting and sufficient views of the upperwing). Michigan City, Indiana. 27 November 2014. Although it may be splitting hairs, the Thayer's has darker wingtips and more pigmentation on both webs of p7-p10, lacking the large white tongue tips shown by the Kumlien's. This is not to say a similar-aged Kumlien's wouldn't, or couldn't, show darker inner webs on those primaries. The overlap is tremendous. Herring Gull. 25 November 2015. A few black marks on the outer tail feathers on an otherwise perfect looking adult. I had an hour to "kill" on Sunday and so got out to one of my favorite sites on the Chicago lakefront, Calumet Park, for some Herring flight shots. Every age was recorded with a few neat sub-adults. (A) Adult. Photo 1 of 2. A few interesting 1st cycles photographed in Berrien County, Michigan. 13 November 2015. Nothing like a little November air to get things moving. Consistent westerlys have been whipping strongly here on southern Lake Michigan for the last 72 hours. 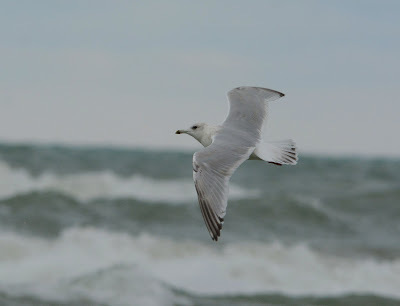 Yesterday, 12 November 2015, I found 2 Black-legged Kittiwakes at Calumet Park on the Illinois/Indiana state line (first of the season). This was somewhat unexpected considering they came in on the "wrong" winds. I was out looking for Franklin's - which I found with little effort - and did a double-take when I spotted both kittiwakes together, wheeling, some 3/4 mile off shore. Today, 13 November 2015, I had my best day of the season with 9 species and 3 putative hybrids in Berrien County, Michigan. (1 of 8) Presumed Glaucous-winged x Herring. Berrien County, Michigan. 13 November 2015. (4 of 8) With Herrings. (1 of 3) California Gull (2nd cycle). Berrien County, Michigan. 13 November 2015. Superficially resembles a similar-aged Herring Gull. Greenish-gray leg color, downward gape and post-ocular line are classic CAGU marks. Relatively bulky size can possibly be attributed to subspecies, L.c. albertaensis. (3 of 3) Inner primary window is less prominent than similar-aged Herrings. Greater coverts largely dark-centered. (1 of 3) Kumlien's Iceland Gull (2nd cycle). Berrien County, Michigan. 13 November 2015. (2 of 3) With 2nd cycle Herring and Ring-billed Gulls. (3 of 3) Outer primaries are okay for kumlieni. Rectrices are relatively dark for this taxon. (1 of 2) Franklin's Gull (adult). Berrien County, Michigan. 13 November 2015. 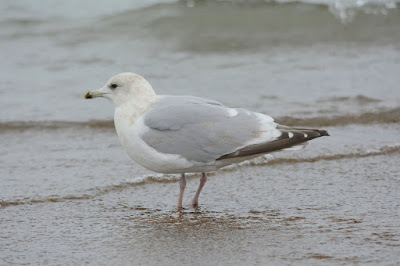 (2 of 2) With adult Ring-billed Gull. (1 of 2) Great Black-backed Gull (2nd cycle). A small individual similar in size to the surrounding Herrings. Almost certainly a female. Berrien County, Michigan. 13 November 2015. (2 of 2) Great Black-backed Gull (left) with putative Cook Inlet hybrid (center) and Herrings. This GBBG is no bigger than the surrounding HERGs - one of the smallest I've seen to date. Berrien County, Michigan. 13 November 2015. 2nd cycle Herring & 1st cycle Lesser Black-backed Gull. 1 of 4 juvenile Lessers present today. Berrien County, Michigan. 13 November 2015. Lesser Black-backed Gull (juvenile). Berrien County, Michigan. 13 November 2015. The first week of November is behind us and large gulls continue to trickle in. Between Lake County, Illinois and Berrien County, Michigan, I recorded 3 Thayer's and 7 Lesser Black-backeds this past weekend. No Great Black-backeds, nor Glaucous, nor Kumlien's Gulls. (1) THGU. Adult. Taken during the last moments of daylight. (2) THGU. Adult. Same individual above. (4) LBBG. Juvenile. Same individual above. (5) LBBG. Juvenile. Same individual above. (6) LBBG. Juvenile. Same individual above. (7) HERG, LBBG and RBGU. (9) 1st cycle HERG with sparse barring on undertail. (10) 1st cycle HERG. Same individual above. 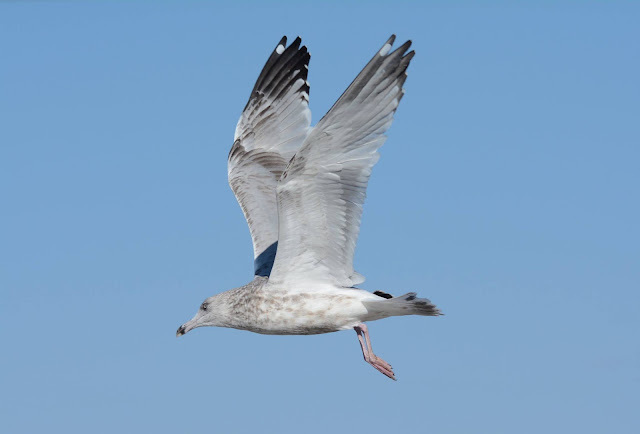 (11) In the field, this adult HERG showed noticeable horizontal barring on the neck/breast, although it lacked the wavy pattern often seen with Glaucous-winged Gulls. Lake County, Illinois. 07 November 2015. (15) A somewhat retarded 2nd cycle HERG. (20) 1st HERG with relatively marbled greater coverts, not too unlike the 2nd cycle above. (21) Juvenile HERG with a couple of replaced scapulars. (22) Juvenile HERG. Open wing below. (23) White ground color to uppertail coverts. Same individual above. (24) 1st cycle with stress/fault bar across rectrices and remiges. (25) Same individual above. The primaries always seem to fair better than the tail feathers when it comes to stress bars. (26) 1st cycle HERG with about half of its scapulars replaced. Vent region sparsely marked. (28) Adult type HERG with p10 still growing. (29) 3rd cycle type HERG with p-molt complete. (30) 3rd cycle type HERG. Flight shot below. (31) Same individual above. The full band on p4 likely age-related. (32) RBGU. Hatch year. Extensive brown scaling on body. Moderate wing covert and tertial renewal. (33) This Ring-billed has to top any hatch year RBGU that I've observed before in terms of post-juvenile feather molt. Most of the wing coverts, tertials and scapulars have been replaced here.